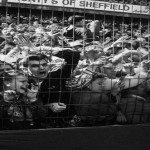 At the time of the FA Cup semi-final between Liverpool and Nottingham Forest, in the late spring of 1989, English football was a sport in turmoil. English clubs were banned from competing in Europe as a result of the Heysel disaster and hooliganism was endemic. It was still the custom to stand in large enclosures and fans were fenced in, often with the use of barbed wire, to prevent pitch invasions. Watching a soccer match was not a pleasant experience. Hillsborough was one of the best grounds in the country and had a long history of hosting sell-out encounters. However, previous matches had not passed without incident and in 1981 around 40 fans were injured in a crush. This led to a redesign of the Leppings Lane End, dividing it into five pens – that decision was later to have dire consequences. Fans had been instructed to arrive at the stadium in good time for the traditional 15.00 kick-off, but many found their journey to the ground delayed by road works on the M62 motorway. When the players took to the field some ten minutes prior to the scheduled kick-off, a large number of fans were still outside the ground. A fateful decision was made by the police to open the gates and allow the crowd in rather than risk disturbance outside the ground. As more and more fans poured into the enclosure, those inside were pushed against the perimeter fencing. A catastrophic crush ensued but this remained unnoticed, except by those affected, as the game kicked off. BBC television cameras were at the ready to record the game, but instead a decision was made to go ‘live’ from the ground as the developing disaster unfolded. The game was halted after six minutes. Scores died, mainly through asphyxiation, and hundreds more were injured. What was the Hillsborough Stadium Disaster death toll: 94 people died that day and a further two died later in hospital. Over 700 were injured. You should know: Sections of the press sought to blame hooliganism rather than poor crowd control by the police, in what must go down as one of the most shameful acts in tabloid journalism, The Sun newspaper, under a headline ‘The truth’, published fabricated stories of fans attacking the police and even robbing the dead. Feelings still run high on Merseyside today and The Sun is seldom seen in newsagents there.